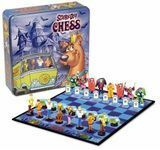 Chess with plastic figures from the Scooby-Doo! show. One version came in a tin, the other in a cardboard box.